Thank you all for making the time to come and celebrate with us the blessing of these humble buildings. Today is a very important day for us, not only in the history of this creche, but in our life together as the people of God. Just a month ago, this creche turned 17 years. Yes, that’s how long it has taken to be where we are today. The creche started from small beginnings on 10 June 2001 as a Saturday feeding scheme for orphans and needy children, operating from a caravan at Maboloka Clinic, which you passed on your way here less than a kilometre away. MaDikeledi Khacha was instrumental here. Two years later, the caravan grew into a “mokhukhu” – a shack – with just two rooms, serving 8 children who were attending during the week. In fact, only one room was used for learning, because the other room served as a kitchen. Then, in 2006 this double-stand on which we are today was donated to the diocese by the lekgotla, or the chief of this area. It was through the efforts of Christina Mogale, a social worker from Madidi, that a donor installed the “zozo”, or prefabricated structures, that we are replacing today. At that time, the number of children had grown to about 20. Seeing that the children had nowhere to play, the St Mary’s Diocesan School for Girls built these shelters under which we are gathered and the play area over there, including that sandpit and the swings. Throughout this time, there were no proper facilities here for the children. Water was fetched from the village using 20 litre water containers “Digubu”. Toilets were initially unhygienic buckets, and even later when long-drops replaced them, they were only covered on the sides. You can imagine how degrading this must have been even to little children and indeed how fatally risky it must have been, judging by stories we have heard of children falling into pit latrines in provinces like the Eastern Cape and Limpopo. It was only in 2017 that proper toilets were constructed ,tiled by our fellow parishner’s at Corpus Christi Garsfontein and St Francis Waterkloof, Corpus Christi installed a borehole also so that they can have access to clean water. St Alban’s College for Boys installed a new kitchen unit and a cabinet in the store room .Sis Dorah from St Francis Waterkloof heard me saying that I will be happy if we could build a proper classrooms for the children because when it rains water come through the classes , she later asked me to do a presentation to Nozala Trust around June 2017, the Trustees of Nozala Trust gave us a substantial donation in December, supplemented by donations from Eurico Ferreira and St Mary’s Diocesan School for Girls, which enabled us to construct this new building. The building comprises 4 classrooms, an office area and a sick bay. Unfortunately, Rosanne Blackbeard from St Martin’s, Irene, who generously donated brand new and high-quality mattresses and blankets for the children could not be with us today. So, this building which we are blessing today, marks the culmination of the work of many caring people over a long period of time. To you all who contributed financially and labouring , I express my heartfelt appreciation and that of the church, the children and the community for making it possible for us to realise this dream. As we stand here today, this creche has 54 children, 33 of whom are girls and 21 boys, aged between 3 months and 6 years. The crèche is registered with the Department of Social Development. 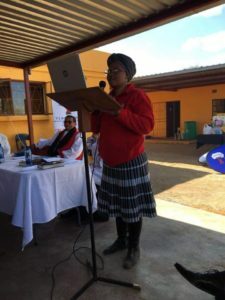 Our partnerships with the Department of Health and Bojanala District Municipality ensures that none of the children miss their necessary immunisations, and those with pyscho-social problems receive attention from social workers. The team of our dedicated staff who are volunteers earning a minimal stipend, led by centre coordinator Matsietsi Monethi, maintain a safe and conducive environment, through a structured curriculum which includes learning, playing and enrichment activities .The children and their families are also offered pastoral care by our local parish, led by Fr Elias Lekoro, the priest at St Paul’s church, not very far from here. Most of the children served by this crèche are either orphans or come from destitute families. For many of them the balanced meals they receive here are the only meal for the day. This crèche is also a distribution point for scores of food parcels and items of clothing that we collect from the faithful of the Anglican Church and give to vulnerable households whom we have identified through the work of the crèche. Some of the parents are here today. From all that I have said, we can all agree that life is hard for these children, and for the community of Maboloka – and you yourselves can see the conditions under which the people live in this area, 25 years after democracy. I have no doubt that what these children and their parents want is for the hardships to disappear, and to have the best facilities for their children, like those crèches in other parts Pretoria. That is what they want, and what we all want for them. But what they need is tenderness. What they need is to be loved. What they need is a companion for the journey, today you became that love and companion they have been looking for. So, today my own heart is full of joy and gratitude because our children will be able to learn in conditions that are better. Their dignity has been restored. As today’s Psalm says, “The Lord does not forsake his inheritance.” And, indeed, “God’s consolation has brought us joy”. It is my prayer that the community of Maboloka, as stewards of this gift, will look after and protect this asset so that it can serve future generations. May the fruits that we see today encourage us all to do more not only for this crèche but for all other people in need throughout our diocese. As scripture says, “Let us not become weary in doing good, for at the proper time we will reap a harvest, if we do not give up. Therefore, as we have the opportunity, let us do good to all people, especially to those who belong to the family of believers” (Gal 6:9-10). And let us, acting together, so continue the mission of our Lord, “to bring good news to the poor, to proclaim release to the captives and recovery of sight to the blind, to let the oppressed go free and to proclaim the year of the Lord’s favour” (Lk 4:18-19). 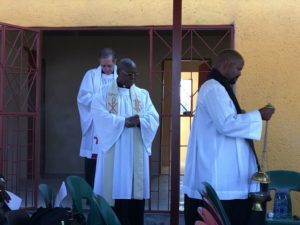 And to our Beloved Bishop Allan a dedicated servant of the people of God, Archdeacons, shepherds of God’s people, the board members of Tumelong Mission thank you very much for your leadership, encouragement and support. A big Thank you to the Chief and elders of these community in providing the land and allowing us an opportunity to serve the vulnerable in this village. To the Anglican clergy, Organisations, Guilds and Friends of Tumelong thank you for your support in this Mission of Development. Lastly I would like to thank the Madibeng Archdeaconry, especially the Anglican women Fellowship from Manche Masemola in Letlhabile, St Paul Maboloka and other community members for being with us every day for the past two weeks to clean up and prepare for today. This entry was posted on Saturday, July 21st, 2018 at 12:36 pm	and is filed under Uncategorized. You can follow any responses to this entry through the RSS 2.0 feed. You can leave a response, or trackback from your own site.